Visit our amazing location on the Twin Coast Discovery Route. 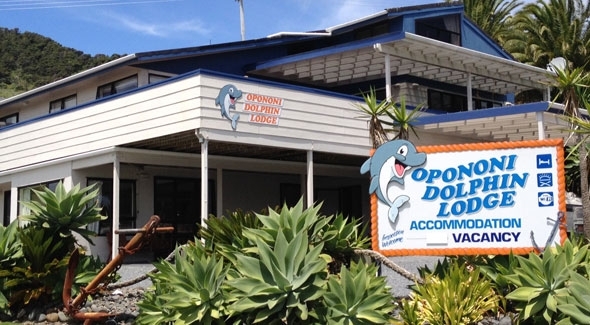 Opononi Dolphin Lodge owners John and Sue are proud to offer a clean and modern interior combined with a superb location, opposite a beach reserve on the edge of the spectacular Hokianga Harbour on Northland's west coast. During the day you can sandboard on the dunes across the harbour, go deep-sea fishing, coastal-walking or visit Tane Mahuta - the giant kauri tree in the Waipoua Forest, which is located only 20-minutes drive away. Then in the evening, sit back and enjoy the breathtaking sunsets and our friendly Kiwi hospitality. The West Coast diamond in the North awaits you! 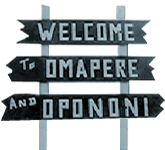 This unique Bed and Breakfast lodge has a range of Opononi accommodation options to suit individuals, couples or families. 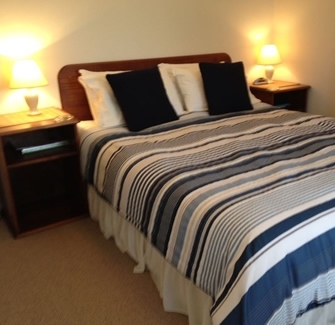 There is one queen-size room with ensuite, and one queen-size room and one twin room with a shared bathroom downstairs. The bedrooms lead into a large open-plan lounge and kitchen, available exclusively for guest use. A continental breakfast is included in the room tariff, which is served up to eat at your leisure in our guest lounge. A comfortable 1-bedroom self-contained unit situated up behind the Opononi Hotel with lovely harbour views and close to amenities and sand dunes. The unit has a basic kitchen with microwave, small oven, fridge, bathroom with shower and separate toilet. Extra person: $15 (Book online as Ryan's Retreat). Cancellations: Cancellations can be made up to 48hrs prior to check-in with no charge incurred. Bookings after this time will incur a charge for the first night of stay unless the room can be filled by another customer.